To save the hassle, I prefer using HotelsCombined to compare and get the best available rate on my stay. It's an useful and reliable site for you guys when planning for your lodging, because it already consolidates all the offers given by each booking site in one page. After some consideration, I decided to spend my week staying in Bun Kao Guesthouse (Address: 0566, Group 21, Wat Bo Road, Siem Reap Central Area), a very homey 4-storey house run by Mr. Bun Kao and his family. Location wise, it is set 3 km away from the myriads attractions and landmarks of the city (i.e. : Night markets and Pub Street). A brisk 15-minute walk will suffice, otherwise you can take a tuk tuk ride which is readily available right in front of this guesthouse. My room was pretty decent as it was well-equipped with air-conditioning, fan, wardrobe, half-length mirror, TV, table, clothes hanger and most importantly, water heater in a private washroom within the room. WiFi in the room was slightly unstable at times, unlike the strong WiFi at common living area. In terms of cleanliness, it was okay but not extraordinary. I appreciated the cool breezy air from the window (especially during dusk) and its quiet and calming environment at night. Each floor has a beautiful verandah with wooden arm chairs, overlooking the neighbourhood area. Unfortunately, there is no swimming pool here, but you can always go next door to another guesthouse for its pool (Charges applied). Food is easily accessible in this area too. Daily breakfast is included, available from 7am to 10am. However, special breakfast items are subject to additional charges-- about USD $2 to $3 which I personally find it reasonable. I think the complimentary breakfast is good enough to kickstart the morning. I actually love the crunchy bread that looks something close to the Vietnamese Banh Mi or French baguette. Best combination with the warm omelette and slab of butter. The common living room, where the reception and dining area are located, is equally cosy and comfortable. It is a popular place where many expats are renting, so I am glad to make friends with few foreigners there. I love the homey feeling here where I can play the guitar, watch TV and read any books available on the shelves. It'd be great to chill around the living room after an exhausting day of exploring the city. 1. 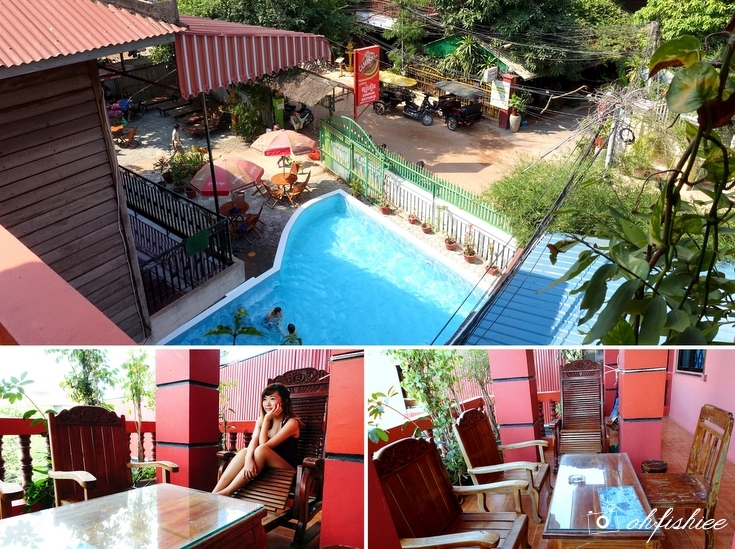 Bun Kao Guesthouse is a cosy home away from home! 2. The host, Mr. Bun Kao himself is very friendly, chatty and able to communicate well in English. Any help you need from him will surely be entertained. 3. For below RM100 per night, it is an amazing stay considering its nice location, good food, decent cleanliness and comfort. Cheap and looks not bad o... Great to stay there! 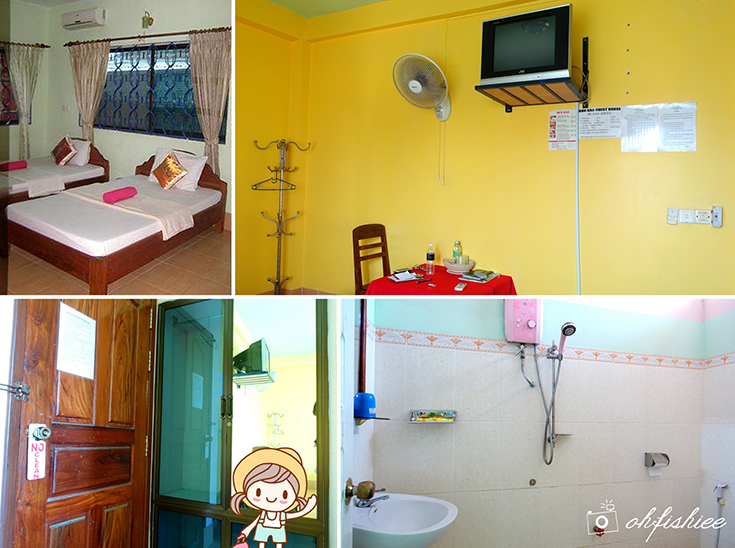 This homestay looks decent and clean with all the basic necessities. It has been a long time since I last visited Angkor Wat. that's a homestay? wow, so nicely decorated the interior! like!